Both the Single Shaft and the Double Shaft Tape Tools may be EITHER Clamped or Bolted into place. Two 4 inch (10cm) C-clamps are included with each tape tool. The WEBERmade clamps to the end of any work bench or table in minutes. Therefore, it does not take up any valuable work area and is always there ready to go to work for you. Our unique clamp-on mounting end brackets make it quick and easy for you to set up and is also easily moved from one location to another. Both the Single Shaft and the Double Shaft Tape Tools clamps to any surface up to 4 inches thick or may be bolted into place. In figuring out which of the 4 sizes to chose from, the size of your plotter is not a factor. Reason being, you can put more than one roll of tape on the shaft at the same time. You should take into consideration the width of your table or work bench where you are planning to use it. For example, the 24 inch tape tool will hold up to 24 inches of tape. 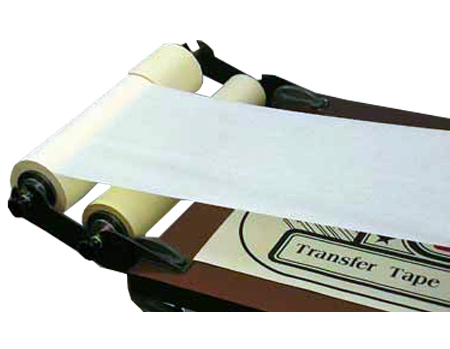 You can put on one roll of 24 inch tape or you can put on any configuration of rolls of tape up to 24 inches wide. You can also put on one roll of tape any size up to 24 inches wide. You can, but you don't have to fill up the shaft with tape. The end support mounting brackets when they are fastened to your table are 3 inches wider than the tape tool. The 24 inch tape tool mounting brackets when properly mounted measure 27 inches to the outside edges. Many people elect to invest in a tape tool that is wider than where they are planning on using it. This allows you the opportunity to custom fit it to your work bench or table. The WEBERmade Tape Tool is clearly the professionals choice.